When you are making big power, the stock parts just don't flow enough air, and become a restriction to power. 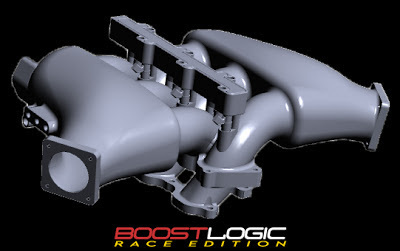 The stock intake manifold, or plenum, does a good job for 545 horsepower, but at double or triple those levels it is a little lacking. 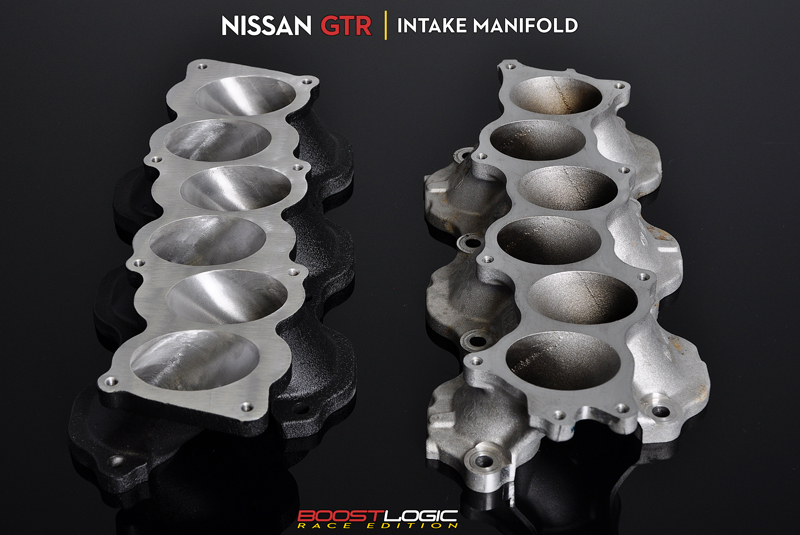 Boost Logic has just released some information on their new intake manifold for Nissan GT-R's. 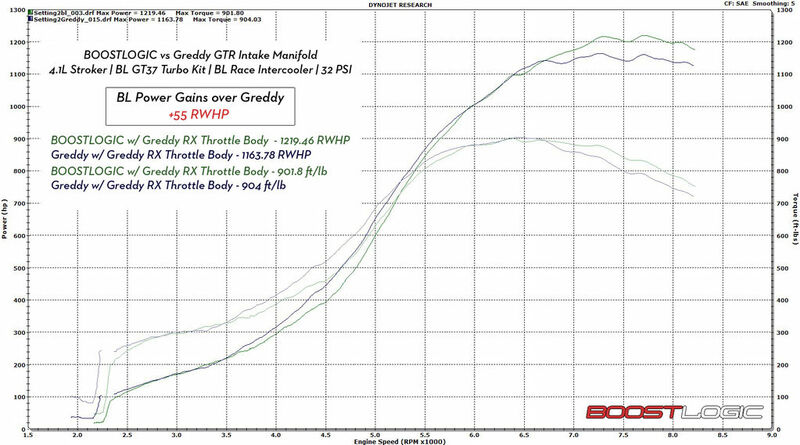 If you are making big power on a GT-R, you need about 1cc of fuel injector per horsepower. What used to be considered a large injector, a 1000cc injector when run on a fuel like E85 just doesn't give you much headroom to operate. There are larger injectors, but with a larger injector, its tough to get the car to be happy under all conditions. When the injector pulsewidths get low, the injectors can be a little erratic causing some stumbles. 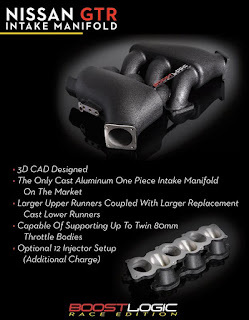 This intake manifold gives the option of running two sets of injectors. I just recently saw a car running a primary set of 1000 cc injectors, with a secondary set of 2000 cc injectors. Enough fuel for about 3000 hp. Its nice to have some headroom in the fuel system. 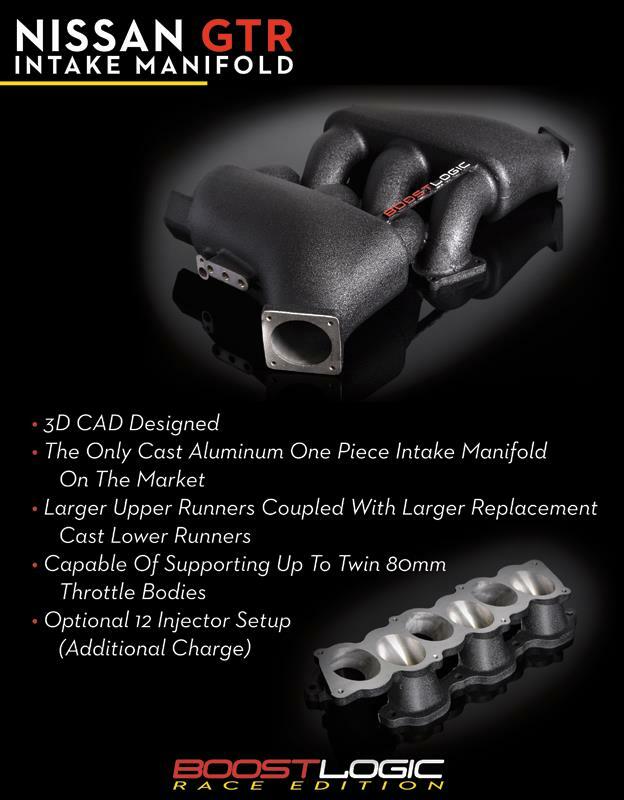 A unique aspect of our intake manifold is our new designed lower runners.Casting these new runners allows us to maintain the linear transition fromthe aftermarket plenum to the intake ports on the head. When it comes to maximum power, 6 injectors simply aren't capable ofproviding enough fuel to meet the demands of ethanol fueled engines. We areproviding an optional third rail setup which will allow 6 additionalinjectors aimed directly into the intake port for accurate fueling. The 12Injector Option will be an extra charge on top of the current intakemanifold price. This will include a rail, brackets, extra machining of theBoost Logic Intake Manifold and will be pre-mounted to the plenum upon shipment. We also offer the upper pipe kit for customers that change to our intake manifold.Due to plenum size and throttle body location change the upper pipes have to be modified. We offer the one piece pipe upgrade for a simple install! Pipes available in polished or Crinkle Black. Our 12 Injector Option comes complete with fuel rail, mounting brackets and machined upper plenum for the 2nd set of injectors. Check out the dyno chart and some additional pictures after the break.